In the time of the Vietnam War, the North East Leader a Messenger Newspaper photographed handsome Private Don Goodcliffe of Tea Tree Gully while on active service, on page 3 of the edition dated 3 April 1968. Australia committed a contingent of 60,000 personnel to fight alongside the South Vietnamese and American forces in Vietnam from 1962 to 1972, with the aim of suppressing the North Vietnamese Army (NVA) and Communism in Asia. The Viet Cong (or National Liberation Front – NLF), a common front aided by the North, engaged in guerrilla warfare against anti-communist forces. The Viet Cong fought to unify Vietnam under Ho Chi Minh’s Ho’s Lao Dong (Worker’s Party). Men fought mainly in the army but navy and air force personnel and some civilians also served in the long conflict. Women went to Vietnam working as nurses in the military, as civilians working with the Red Cross and as journalists. There were also Australian Embassy female staff and entertainers. In 1964 the Australian Government led by Robert Menzies had reintroduced conscription through a National Service Scheme. If you were a male aged 20, you had to register with the Department of Labour and National Service and your name could be randomly selected for national service by your date of birth. This was basically a scheme to increase the number of military personnel the Government could send overseas to 40,000. If you were unlucky enough to be selected, it was likely you were going to fight in Vietnam (https://www.awm.gov.au/articles/encyclopedia/conscription/vietnam). Just about everybody would have known somebody who was conscripted, sometimes even a brother or a friend. Australians who resisted the draft were jailed. The North East Leader makes reference to Operation Pinnaroo in the caption accompanying the photograph of Don Goodcliffe and the Vietnamese interpreter. The Long Hải Hills where Private Goodcliffe was deployed are situated near Long Hải, in the Long Điền District of the Bà Rịa–Vũng Tàu Province in Vietnam. Unfortunately, in 1967 Brigadier Stuart Graham had ordered Australian forces to plant 21000 M16 mines throughout the hills. The deployment of the mines was supposed to form a barrier to stop the Viet Cong from gaining access to and infiltrating nearby villages in the vicinity of the Australian army task force base at Nui Dat. The Australian troops failed to adequately defend this rugged territory, which was full of thick scrub. The Viet Cong seized control off the Long Hail hills. Their recruits dug a network of tunnels to store supplies and establish a military stronghold from which to plan and stage attacks. Viet Cong troops had learned to reposition the mines and use them against the enemy. Operation Pinnarro led by Brigadier Hughes in early 1968 was terrible. It was designed to be a reconnaissance and attack mission, to destroy the Viet Cong’s military installation along Long Hai. However, the Viet Cong had anticipated the Australian attack. They did not even need to shoot the Australian soldiers. 15 Australians were killed and 33 wounded by walking in the terrain. 42 allied soldiers were also killed and 175 were wounded. And of course the mines did not just disappear. We have no statistics to tell us how many local Vietnamese people had their lives ruined by encounters with the land mines (http://vietnamswans.com/revisiting-the-long-hai-hills-43-years-later/) More Australians would die or be maimed by the time our forces withdrew from Long Hail and left Vietnam. By 1969 many people believed that Australians should not be fighting in Vietnam with the United States and that it was a conflict that could not be won. Rallies in the streets against the War and conscription became violent and protesters were arrested. The antiwar sentiment was so strong among the Australian public that our troops who had bravely served in horrific conditions in Vietnam were reviled and they were abused upon their return to Australia. 521 Australians died as a result of the Vietnam War (496 of these were from the Australian Army) and over 3,000 were wounded. Since Don Goodcliffe’s name is not listed on the Australian War Memorial site among the fallen, we may assume that he came home. In 1997, the Australian Government signed the Convention on the Prohibition of the Use, Stockpiling, Production and Transfer of Anti-Personnel Mines and on Their Destruction which is also known as the Ottawa Agreement. 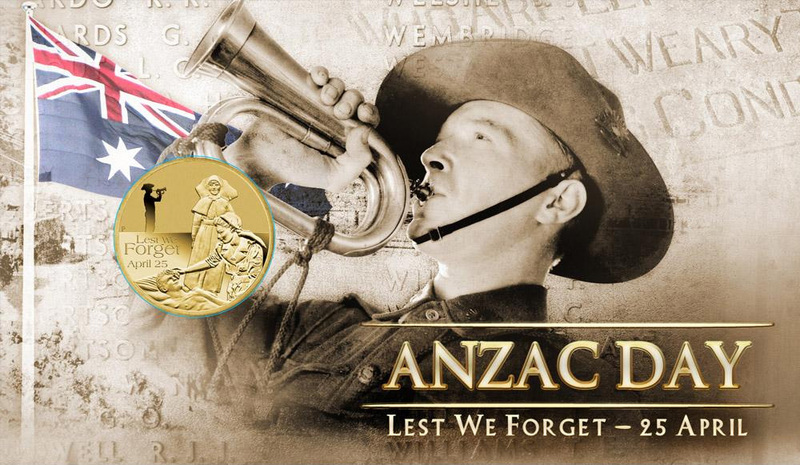 The Library will be closed on Wednesday 25 April, for the Anzac Day public holiday. The chutes adjacent the car park will be open for return of items. The Library will reopen from 10am – 5pm on Thursday 26 April. long after they had ended. A special breed of mateship grew. Second World War 1939 – 1945. Robert John Jarrad, Page 47, Slouch Hat Soldiers Generations at War, an Echoes Downunder publication, 2014. Robert John Jarrad speaks about his poety at the Tea Tree Gully Library. 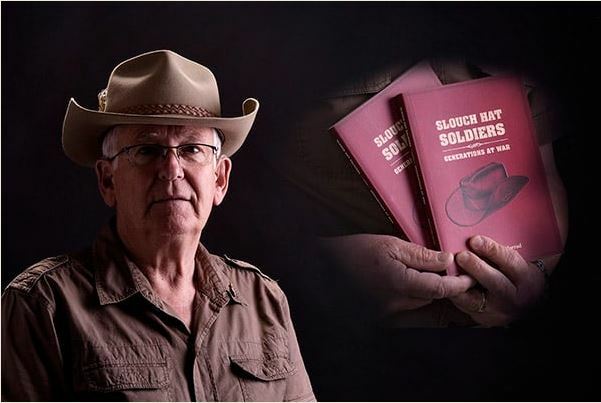 When local retired engineer, military gunner, artist, didgeridoo player and writer Robert John Jarrad launched his first book of poems Slouch Hat Soldiers – Generations at War at the Tea Tree Gully Library in March 2014, there was standing room only. Accompanied by illustrations from by internationally acclaimed military artist Barry Spicer, Robert’s collection of poignant war poetry focuses on Australians who enlisted when their country called. Robert based his poems mainly on the powerful stories and images told to him by his nineteen relatives – including his father and grandfathers – who had enlisted and served in World Wars I and II, and in the Vietnam War. As we hear in his poem Brothers in Arms, Robert’s poems give us an insight into the harsh realities of war, but he also describes the mateship between soldiers and how they used humour to cope with their dire situation. Robert hopes reading his poems may help a new generation of Australians to understand what it was like to go to war and how those who served were prepared to give their lives for their homeland that they loved. Moreover, they came back forever changed by their experiences. 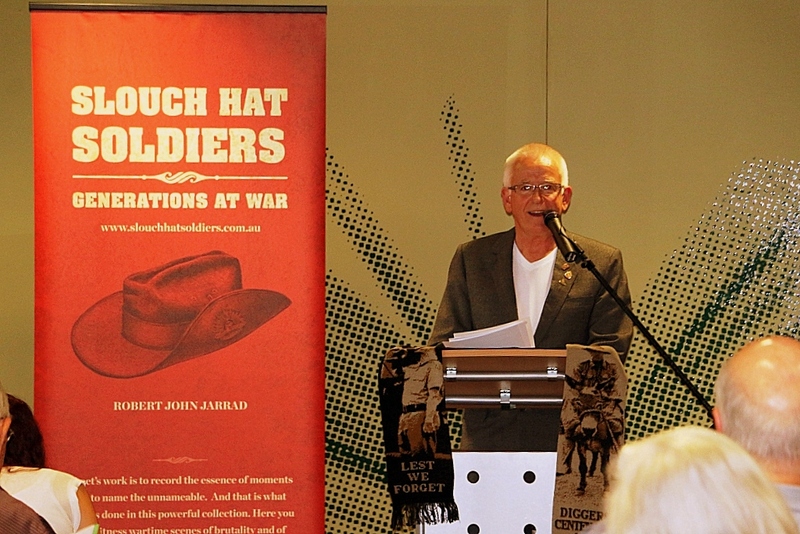 Since the launch of Slouch Hat Soldiers – Generations at War, Robert Jarrad has toured around Australia, speaking to community groups about his book. He has been invited to several Centenary of Anzac events. In 2015, Robert’s poems, selected from his book Slouch Hat Soldiers-Generations at War, were performed at the Australian War Memorial’s ‘Of Words and War’ Anzac Centenary poetry event. Now Robert’s literary achievement has been honoured once again. Some of his poems will feature prominently in the upcoming Wish me luck – an Anzac Centenary photographic exhibition, which pays tribute to South Australia’s World War II veterans. The exhibition is showing from 9 July to 11 September, in the Flinders University City Gallery, located within the State Library of South Australia on North Terrace. ‘Poster boy’ for the Wish Me Luck exhibition, Vale Clifford (Cliff) Bryce sits aside his portrait. Curated by Sharon Cleary (Veterans SA) and Louise Bagger (AIPP), the Wish me luck Exhibition has grown out a special nationwide project, which began on Anzac Day 2015. The Australian Institute of Professional Photography (AIPP) photographed Australia’s surviving World War II veterans, many of whom are now in their late nineties. In South Australia 1050 portraits were taken over a seven month period. 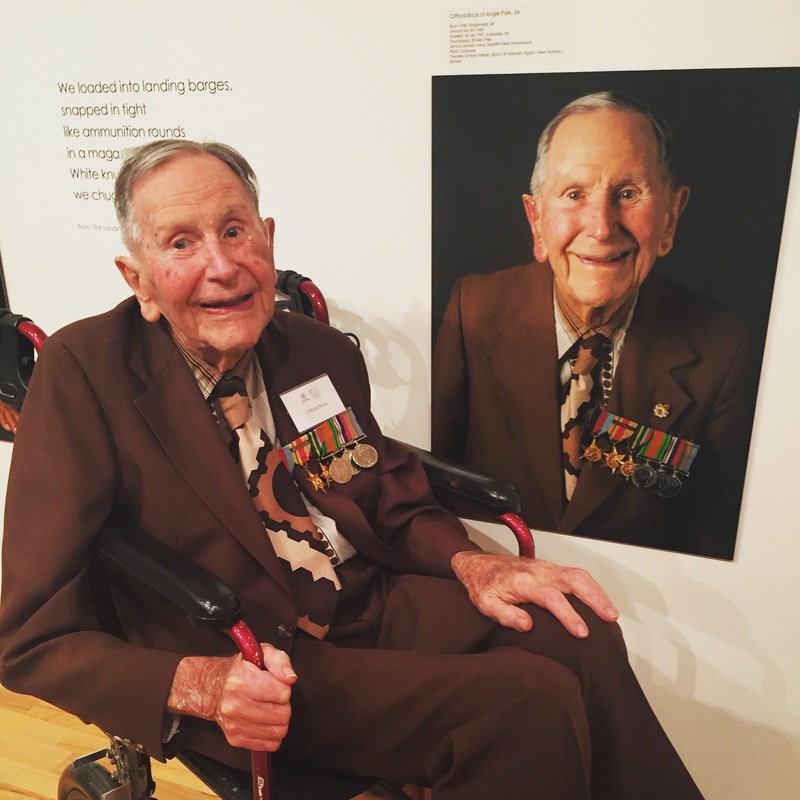 Veterans SA is partnering with AIPP, Flinders University Art Museum and Atkins Photo Lab to present 100 photographic portraits of those who served in the Navy, Army, Airforce and Medical Corps from SA during WWII. Entry is free. The Flinders University City Gallery is open Tuesday to Friday from 11am – 4pm and Saturday and Sunday from 12 – 4pm. A series of public talks will accompany the ‘Wish me luck’ exhibition. Come and hear Robert reading from Slouch Hat Soldiers on Sunday 4 September at 2.00pm at the Flinders University City Gallery. RSVP essential to 08 8207 7055. Copies of Slouch Hat Soldiers – Generations at War, will be available for sale. Part proceeds of all book sales will benefit Legacy. You can also borrow Slouch Hat Soldiers – Generations at War through the One Card Network. Search the online catalogue or enquire next time you visit the Library. Discover more about Robert Jarrad and his acclaimed book Slouch Hat Soldiers. 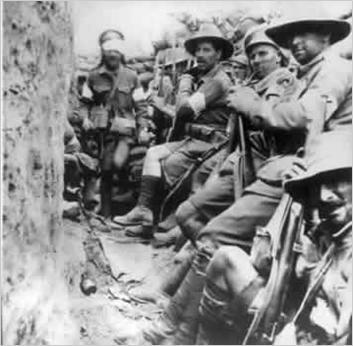 You can also explore the 100 Years of Anzac website. Read more about the Wish me luck exhibition and Robert’s poetry reading. The Library will be closed on Monday 25 April for the Anzac Day public holiday. The chutes outside of the Library, adjacent the car park, will be open for return of items. The Library will be closed on Saturday 25 April, for the Anzac Day Public Holiday. It will be open on Sunday 26 April for normal trading hours, from 1pm-5pm. The chutes outside the Library adjacent to the car park will be open for the return of items. To commemorate ANZAC Day, Anstey the Library’s resident mascot thought it might be fitting to review the children’s picture book ANZAC Biscuits, by South Australian children’s author Phil Cummings. This touching story is about an Australian family torn apart by war. Set during the time of World War I, Rachel and her mother are at home on their farm in their warm and safe kitchen, while a young soldier is miles away across the ocean in the trenches of a cold dark battlefield. “Let’s make some biscuits for Dad,” suggests Rachel’s mother, and she and her daughter begin to mix ingredients and set about baking biscuits. With each turn of the page the story moves back and forth, from the warm family kitchen where Rachel and her mum are baking the special biscuits, to the cold bleak battlefield where the young soldier is struggling to stay warm. 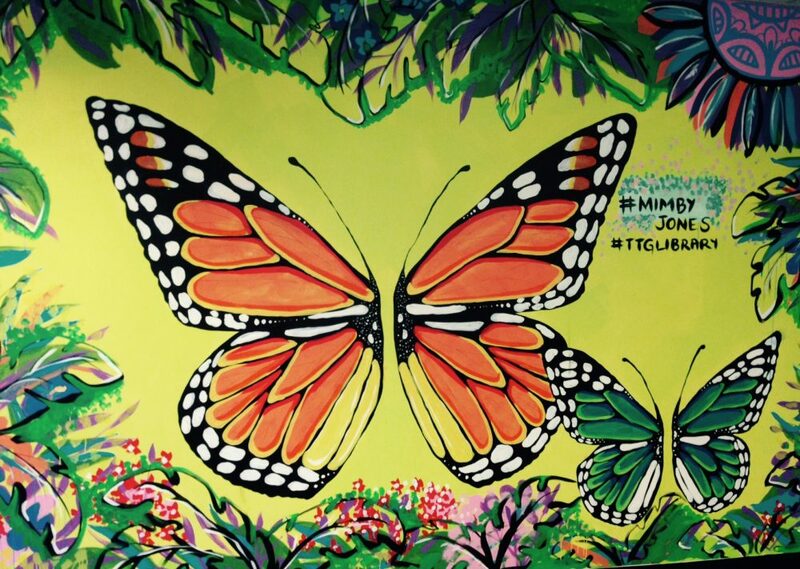 Illustrator Owen Swan has done an amazing job with his pictures. The kitchen scenes are painted in warm yellow hues which contrast with the grey illustrations of the soldier’s world. As the scenes flit back and forth some clues are given to the identity of the young soldier. The final pages reveal the young soldier to be Rachel’s father and how he is very grateful for a gift from home. “These are the best biscuits ever … Daddy will love them, won’t he?” said Rachel. And he did. 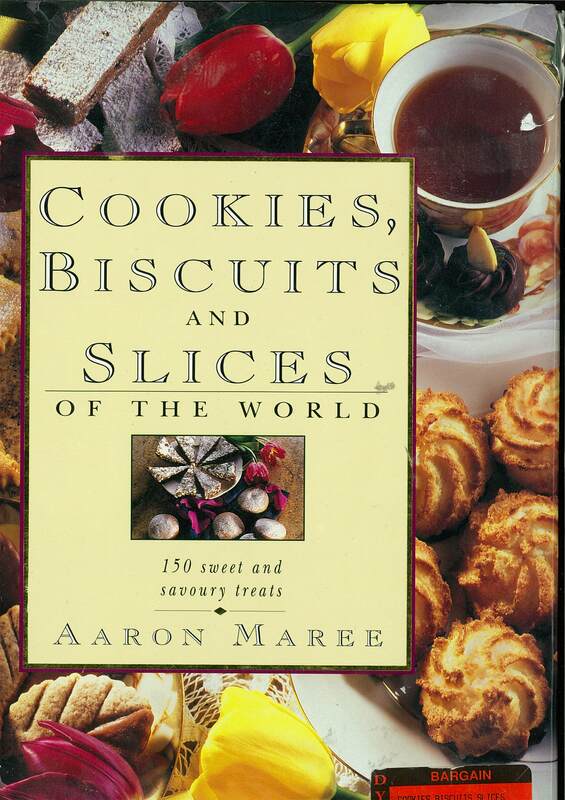 You can borrow Anzac Biscuits from the library here. 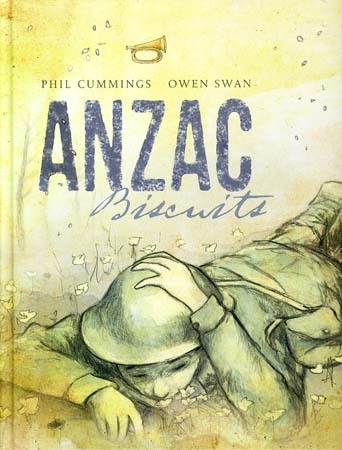 There are lots of other books on ANZAC Day as well.